Theatre Odyssey has been promoting the wonderful worlds of Greece and Rome through all the arts since 2000. We are finding more and more that schools are closing down Classics departments, people don't know what Classics is, the teaching of Latin and Greek is in decline, and there is a need for people to learn from history more than ever. To commemorate Theatre Odyssey's tenth anniversary (and beyond!!!) 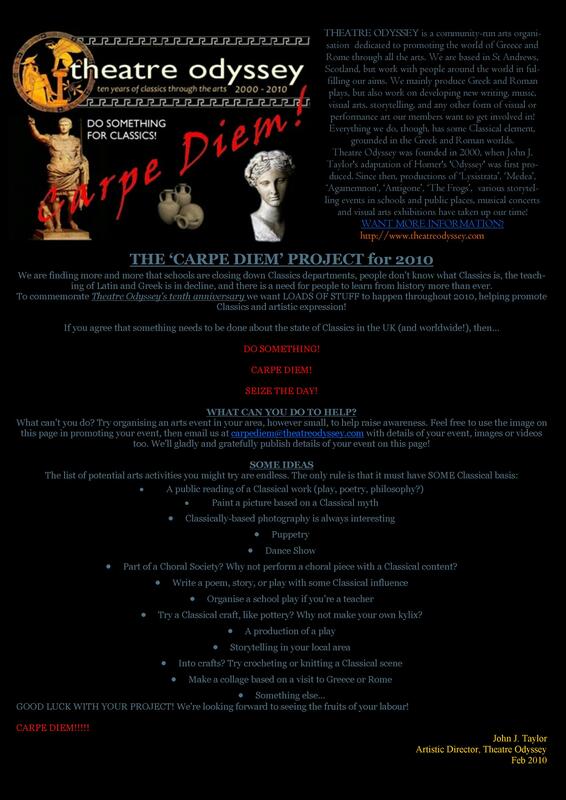 we want LOADS OF STUFF to happen throughout 2010, helping promote Classics and artistic expression! What can't you do? Try organising an arts event in your area, however small, to help raise awareness. Feel free to use the image on this page in promoting your event, then email us at carpediem@theatreodyssey.com with details of your event, images or videos too. We'll gladly and gratefully publish details of your event on this page! A public reading of a Classical work (play, poetry, philosophy?) Why not try somewhere people would be anyway like the pub? Part of a Choral Society? Why not perform a choral piece with a Classical content? Try a Classical craft, like pottery? Why not make your own kylix? Think about how you will get your work seen by other people? Or do you just want to post it on theatreodyssey.com? No matter how small your project is, it just might make someone think about Classics, and that's what we're all about! GOOD LUCK WITH YOUR PROJECT! We're looking forward to seeing the fruits of your labour! HERE ARE SOME EXAMPLES OF PEOPLE DOING SOMETHING FOR CLASSICS.